I’d just read Great Tales from English History by Robert Lacey, which is a wonderful read for anyone wishing to give themselves a crash course in English history from pre-Roman Britain to Watson and Crick. Anyway, Lacey had a bit about Canterbury Tales, describing how much fun it is but also how important it was as the one of the first great works of literature written in English. I couldn’t resist–I headed downstairs and read the General Prologue and part of the Knight’s Tale, but I saved the rest for later that semester, when I knew my class would be reading several more of the Tales. I don’t usually go into a book expecting not to like it and end up liking it–usually it’s the opposite. To answer this question I had to go back years and years ago to when my mom was trying to get me to read From the Mixed-Up Files of Mrs. Basil E. Frankweiler by E.L. Konigsburg. For some reason I’d made up my mind that I would hate it (I have no idea why, 8-year-old logic is confusing). But when my mom actually read it aloud to us on a road trip, I loved it! I guess that’s where I began to learn not to prejudice myself against a book right off the bat. Behold, my family’s ancient and very cheap copy of The Last Battle by C.S. Lewis. Honestly I’m not sure where I discovered this–it’s always been in the house, I guess. Two or three different family friends or relatives recommended that I read Brideshead Revisited by Evelyn Waugh. Like The Loved One, another Waugh book I had read at the time, I had to re-read Brideshead before I understood any of it. I still don’t completely understand everything it’s saying, but I think it’s a beautiful and slightly bizarre picture of interwar to WWII Britain and divine grace. I discovered Gene Luen Yang’s two graphic novels Boxers and Saints through the book blog Pages Unbound. There wasn’t exactly a lot of hype surrounding the books, but they are my favorite graphic novels and probably my all-time favorite YA books. I liked them even more than I’d expected to! Find a book on your shelves or e-reader with a one word title. What drew you to this book? I wanted to read Scoop by Evelyn Waugh for two reasons: first, I’d just finished Brideshead and I wanted more Waugh; second, that I was (and still am) writing a novel about journalists in interwar Britain. So I would be researching for my book and reading Waugh at the same time! Win-win! What book did you discover through a film/ TV adaptation? I watched Studio Ghibli’s Howl’s Moving Castle before I even knew that it was based on a book by Diana Wynne Jones. But after reading a review of the book on the blog Lost: Purple Quill, I wanted to read the book as well. I’m glad I did–the book and movie are very different, but I prefer the book. I love its lighthearted tone and flawed but loveable characters, and it’s also one of my favorite YA books! Think of your all-time favourite book/s. When did you read these and why did you pick them in the first place? 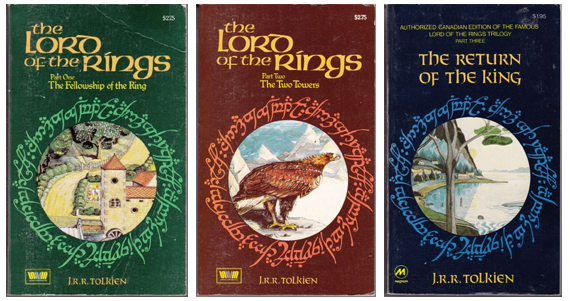 I’m going to have to copy Holly and go with Lord of the Rings. I finally buckled down last summer and read them via the wonderful unabridged audiobook narrated by Rob Inglis. I’d spent my entire life hearing my friends and family sing their praises, but I’d never actually done it. But after marathoning the movies and listening to snatches of the audiobook with some close friends, my sister and I decided that we had to read them for ourselves. I feel silly about tagging anyone, since I wasn’t tagged myself, but if you’d like to do it, go for it! And now I want to hear from you. How would you answer these questions? What do you think about my answers? Let me know in comments! Gene Luen Yang has written a lot of good and provocative stuff. But I really think Boxers & Saints is his masterpiece. I love how the story is told from two different perspectives and he doesn’t tell you which one is the “right” one. It’s also amazing how spare the illustrations can be, and yet they really convey the violence. It’s a really powerful work. I completely agree! It’s such a great take on a war narrative, and I especially love the Christian imagery throughout. Howl’s Moving Castle is totally the book I discovered through the movie adaptation, I only realized it was a book when I paid attention to the opening credits. I adored the movie and love the book! They are so different and yet similar I totally recomend it to all my friends no matter the age! Still can’t get my little sister to read it, so sad! Yes!! Lord of the Rings is one of my all time favorite series, and it so huge in my family, my Dad made us all read the books before watching the movies, and when in doubt you can here my family throwing Lotr quotes at each other. Hahah thanks! I like to think so!